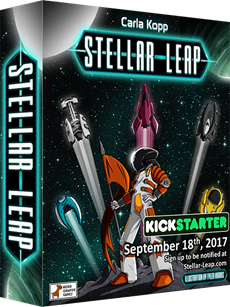 Explore the galaxy, earn prestige and fulfill your hidden objectives in Stellar Leap, an upcoming 4X game by Weird Giraffe Games. Stellar Leap is a space exploration game with resource management, variable player powers, hidden objectives, and game changing events! There's three divisions at your disposal, Intelligence, Mining, and Labor, but they can only be activated once per turn. There's also your High Command, that can take two actions from the following choices: populate, tax, discover a planet, and attack another species. Events are triggered by players at various points in the game and can have minor or lasting effects, usually being better for the player that triggered the event! Turns are fast and player engagement is high as resources are gathered on each player's turn. Are you going to spend your resources fulfilling missions or traveling to the furthest reaches of the galaxy? Take a risk and mine an asteroid and you might just hit it big! Stellar Leap is currently on Kickstarter, so don't miss your chance to explore this new frontier.